In a saucepan over medium heat, add butter, apple, brown sugar, apple pie spice, cinnamon and salt. Stir until soft, about 3 minutes. Add milk and increase heat to medium high until it comes to a gentle boil. Reduce heat to medium and add oats. 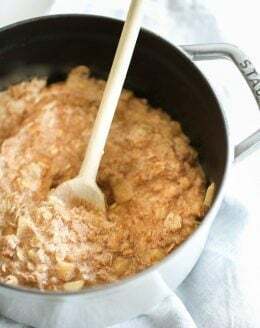 Stir frequently until oatmeal is soft and milk is absorbed, about 5 minutes. Top with walnuts or pecans and enjoy!